Mayor Sylvester Turner, center, with Police Chief Art Acaveda at left, and Congresswoman Sheila Jackson Lee, join thousands of students in Houston’s downtown and Tranquility Park last Saturday, to voice their opinion that Congress needs to pass strong gun control legislation, and end the senseless killing of children in the nation’s schools. 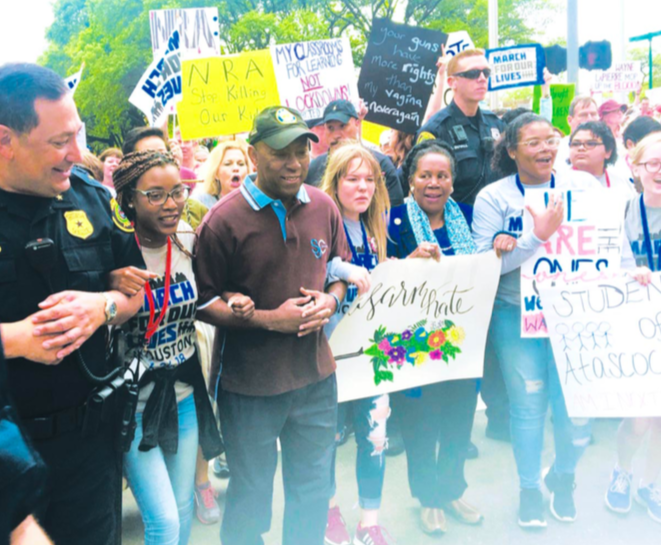 HOUSTON Mayor Sylvester Turner marched in solidarity with thousands of young people Saturday who participated in the March for Our Lives Rally in Tranquility Park across from Houston city hall. During the rally, Mayor Turner announced the creation of the Mayor’s Commission to End Gun Violence which will focus on researching and recommending solutions at a local level. Young people across the country held similar events today to demand safer schools, an end to mass shootings and better gun control. Organizers of the local March for Our Lives Rally invited Mayor Turner to participate during a conference call he had with student leaders several weeks ago. The mayor said he was inspired by the young people’s movement and decided to create the commission to help support their platform. With heavy storms predicted, and flooding throughout the San Jacinto River watershed, authorities this week ordered a permanent reduction in the level of water in Lake Houston. Houston City Council Member Dave Martin announced that after a meeting held Monday with Houston Mayor Sylvester Turner, the daily pooling level of Lake Houston will be reduced from 42.5 feet to 40 feet, effective immediately. Last night, Houston Public Works Director, Carol Haddock, directed the Coastal Water Authority to start lowering the level of Lake Houston in advance of Wednesday’s predicted storms. Council Member Martin has confirmed that all gates at Lake Houston are open and the level of Lake Houston is anticipated to reach the desired 40 foot mark by Wednesday evening. Once the lake is lowered to 40 feet, it is the City of Houston’s plan to adjust the spillway gates to maintain a level of 40 feet moving forward on a long-term basis. This will address the immediate concerns of the Lake Houston Community, including Kingwood, Humble, Atascocita, and Huffman. This lower lake level will continue to be observed while the City works with area partners to address siltation and other coordination efforts with Lake Conroe. The City of Houston will continue to monitor and evaluate water demand, weather patterns and other mitigation activities.